Construction industry; scaffolding companies; scaffolding suppliers. Security of a construction site including scaffolding and ladders is vital to prevent unauthorised access onto scaffolding or other work platforms. Falls from height from scaffolding or incomplete buildings following unauthorised access by the public frequently involve children and result in major and sometimes fatal injuries. Access points may be designed for access or be opportunistic. All such routes may need to be secured by a combination of perimeter fencing, local fencing and ladder removal out of working hours, or securing ladders using a suitable ladder guard to make them unclimbable. Scaffolding on all construction sites, but especially in residential areas, can seem like an inviting playground for children - who do not have the ability to perceive danger in the same way as adults. Clients and contractors must ensure that unauthorised access onto scaffolding is prevented, not just outside working hours, but also at times when workers are present but out of sight. These principles are long-established and set out in HSG151 (see references). This alert is being issued to remind contractors, and those in control of construction work involving scaffolding and access ladders, of the need to assess the site and ensure suitable and sufficient measures are in place to prevent members of the public, and especially children from climbing scaffolds and ladders. There is a history of members of the public climbing onto access scaffolds that have been erected to allow construction work to take place. Children are particularly tempted to climb and every effort must be made to deny ready access onto scaffolds. The primary means of denial should be site perimeter fencing, but there may be a need for additional local fencing and routine removal of access ladders or use of locked guards or covers to make access ladders unavailable. Where unauthorised access has been gained the result is often a fall from height. This can cause life changing injuries and fatalities are not uncommon. Members of the public and parents have a responsibility to take note of safety signs and information requesting that they keep away from areas where construction work is taking place. Children may be too young to read or understand such signs, and in the absence of close parental supervision may be tempted to climb to height. Accordingly, contractors must take greater effort to ensure that the very young are not able to climb onto scaffolding. Ultimately however, there is no way to guarantee that an older or determined person cannot defeat security measures. Therefore, this safety alert is not aimed at preventing all urban adventurers, determined trespassers, vandals or opportunistic thieves from finding a way onto a construction site. It does however set out the basic measures that must be taken, many of which will also provide a degree of deterrence against those more able and determined to enter the site/area. Proximity to residential areas, schools and other public venues. Whether the scaffold is inside a construction site or on the public boundary. Whether the building being worked on is occupied or not. If occupied or in use out of hours (e.g. for site worker accommodation), whether the scaffold features in the fire escape plan. Length of time site is closing for – overnight, weekend, holiday, mothballed, etc. Number of access points onto the scaffold – including the number of levels within an occupied or accessible building that lead onto the scaffold. Whether the places that the scaffold abuts public areas are common areas or under controlled private ownership. Level of privacy – is the access point onto the scaffold quiet or busy, hidden or overlooked? Existing level of security presence – patrols, CCTV, active response to CCTV heat or motion trigger, history of neighbours raising concern and acting to warn off trespassers. Where reasonably practicable, unauthorised access onto a construction site should be prevented by site perimeter fencing. The fencing should be continuous and fixed in place. Where it changes form or butts against another structure it must be secured to prevent anyone squeezing through a gap. If it butts onto another structure care should be taken to assess whether the fencing itself is creating an intermediate climbing point onto the scaffold. Gaps between gates and the ground and between fixed and moveable fencing should be minimised so that small children cannot climb through or under. Site security should be regularly checked and reviewed to ensure perimeter fencing is kept in good order and that there are no materials, skips, plant, etc stored or parked where they may assist a trespasser to climb into the site. At ground level the full length of the scaffold may need to be fenced. This can be particularly important across ground level sway (longitudinal) bracing. In addition, there should be no projecting first lift transoms or ledgers that may aid climbing; and the use of scaffold fans, or sheeting of lifts can also help deter opportunistic access. In occupied buildings or public spaces with access to the scaffold at several levels fencing should be used to close off all access opportunities. For example, in buildings with public access balconies that abut scaffolding, this can mean fencing each level for the full length of the balcony (subject to this not interfering with fire escape arrangements). The fencing should be installed as the scaffold is built, lift by lift, which means either writing this into the scaffold contract or having a separate contractor working with the scaffolding contractor so that there is no lag between the scaffold going up and fencing being fitted. If it is not reasonably practicable for ladders at ground level to be removed, or have ladder guards fitted out of hours, then the area should be secured using padlocked fence panels. Where stair towers are fitted to the scaffold, access at ground and other levels should be prevented by padlocked fence panels. The only exception is where scaffolding or stair towers form part of the planned public escape route of an occupied building. Here you must ensure that arrangements to stop unauthorised access will not interfere with evacuation of the building in the event of a fire. However additional fencing or barriers should be installed to prevent anyone climbing away from the designated fire escape route. Where possible, local fencing within the site should be kept in place during working hours so as to minimise end of shift activity. This will usually need a lockable access gate to be designed into the arrangement. Where ladders need to be used it is good practice to install internal ladders or a ladder tower so that each ladder serves a single lift. This means that it is often possible for the ground to first lift ladder to be removed after each shift and either stored securely in the compound (eg in a locked steel container) or padlocked to the scaffold horizontally at each end to deny use. It is not good practice for workers to place the removed ladder on the first lift as this can make it readily accessible to trespassers and there is a risk of a worker falling during stowage or retrieval. Whenever a ladder is replaced it must be tied or clamped into position to prevent movement in use. For small scaffolds it is common practice for the builder to provide the bottom lift ladder and to take this ladder away each night. This has the advantage that the scaffold contractor completes installation by removing their own bottom lift ladder which immediately prevents access. The removal of these ladders from site is particularly important where it is difficult to fence a site, such as scaffold on some occupied domestic properties or scaffold onto a pavement where pedestrian access beneath the scaffold must be maintained. In general, any additional fencing will need to be provided by the principal contractor unless this is specifically requested as part of the scaffold contract. The bottom lift ladder and additional fencing arrangements should be written into the scaffold contract and details added to any drawings or compliance sheet - by hand if necessary. Where the scaffold contractor is handing over an ‘incomplete’ scaffold i.e. no bottom lift ladder, this should be recorded on the handover paperwork. Adding and removing a bottom lift ladder does not constitute an alteration to a scaffold. Where used any scaffold tag system does not need to be withdrawn if the scaffold is inaccessible. Where there are other routes onto the scaffold that cannot be fenced off e.g. onto higher lifts from sloping ground or balconies, it is good practice to still remove the ladder but the opening must then be blocked, e.g. the hinged ladder gate or trap door is padlocked shut. Note that ladders should not be removed where the route is designated out of hours for fire escape from an occupied building. Ladder removal will in most cases achieve better control than a ladder guard. They must be locked or padlocked in place – rope lashing is not acceptable. They must make each rung unusable – i.e. no more than 50mm of rung should be exposed when the guard is pushed as far sideways as possible. They should cover at least 6 rungs (i.e. prevent the foot being placed on at least 5 rungs). They must not be able to slide over the ladder stile, thereby exposing the rungs. They must not be able to tilt or pull away from the ladder – rungs should not be exposed at the front or be climbable from the rear. Carrying slots, if provided, should be vertical (along the long axis of the guard) not horizontal where they could be used as a foothold. Handles, if fitted, should not provide an alternative foothold. Guards will need to be matched to certain ladders and not used on others i.e. a narrow guard is only suitable for a narrow ladder and if used on a wide ladder sufficient rung width could be exposed to allow the ladder to be climbed. Fabric versions are not suitable for use in public places; or for external use in areas that may be accessed by the public; or for internal public areas that are unstaffed. A ladder guard that is not wide enough for the ladder it is fitted to. Small feet can still climb the exposed rungs and the guard could slide even further to one side. Narrow ladder guards are only suitable for narrow ladders. 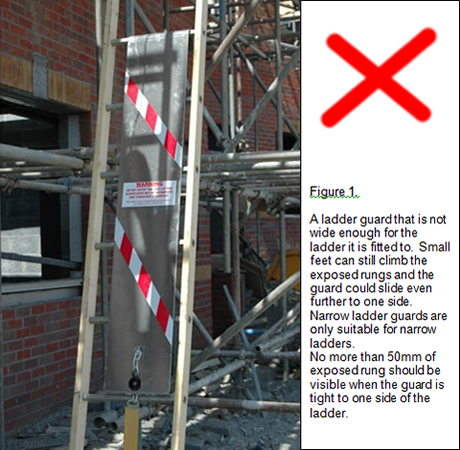 No more than 50mm of exposed rung should be visible when the guard is tight to one side of the ladder. Security personnel either based on site or by visiting patrol. Whilst signage is appropriate, this is a low level of control and unlikely in itself to deter children. The site risk assessment should be kept under review and reports of damage to site or local fencing or trespassing out of working hours should be investigated and security measures reviewed as a matter of urgency. Technical Guidance TG 20:13 A comprehensive guide to good practice for tube and fitting scaffolding - Operational Guide.